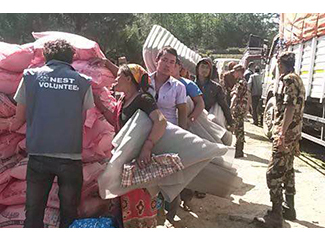 The Foundation will donate to the Nepali NGO NEST World part of the collection of shops registered on Saturday May 2, which amounted to € 8,996. NEST World - Nepal Educational Support Trust is a non-governmental organization working for 15 years in favor of the education of the children of the poorest communities in the districts of Sindhupalchok and Makawanpur. 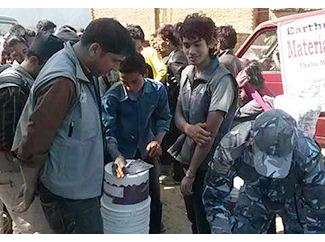 In Sindhupalchok, 90% of houses are affected by the quake. Therefore, NEST is mobilizing the community to deliver aid they are receiving, especially packs of food and drinkable water and first aid kits. Mr. Purna Kumar Shrestha, Founder of NEST said ” We are delighted to hear that fantastic outcomes of Humana FPP’s fundraising appeal, NEST volunteers will ensure that donations from Humana People to People reach out to earthquake victims as soon as possible with foods and basic supplies. NEST would like to thank all customers who purchased second hand clothes in Humana FPP’s stores and this donation will help NEST’s relief efforts a lot”. It agrees also that on Saturday all the clothes were at a special price of 1 euro.